Quick Recap on The Challenge: I came home with a new shirt one night to realize I had PLENTY of shirts hanging in my closet. As a result, I wanted to go as long as possible without recycling one top, and each day I could do that I would make a donation to a charity helping in Haiti, and highlight the charity or fundraiser here on my blog. 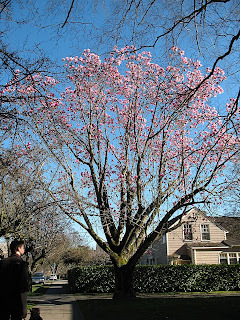 Spring is a comin' here in Seattle. A couple of weeks ago I saw the first crocuses poking up through the mud. 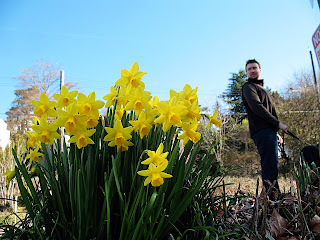 Then, seemingly overnight, the cherry trees blossomed into pink oblivion and daffodils bloomed and the tulips are budding. I love being somewhere where I can see the change of the seasons, even though it feels like we didn't really get a winter compared with last years' snow and ice nightmare. Except for a week in December temperatures have stayed pretty warm, and my studded tires have definitely not been needed as of yet. 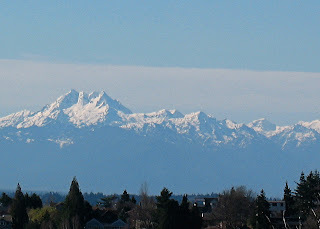 I've got this itching to get up in the mountains and see spring announcing itself there. Yesterday morning when I took Roy out everything was bright and quiet. The wind was blowing and it sounded like a friend standing behind you playfully boxing your ears. It made me want to turn around and chase it, giggling. On another note, Thursday was Matt's birthday! Happy Birthday Matt! He's a whopping 27 years old now! Heater was broken in the office and a sweater was needed. Also needed: Blue Steel facial expression. I hear that song in my head every time I wear this shirt...even though its a technical quick-drying shirt from North Face. My vacuum cleaner made a cameo appearance as well. The day of many outfits. We went to The Stumbling Goat Bistro for dinner (wow, sooo delish! ), and then went to see the musical Company. More on that later, but at least dinner was great! Today's charity spotlight goes to an album, actually. 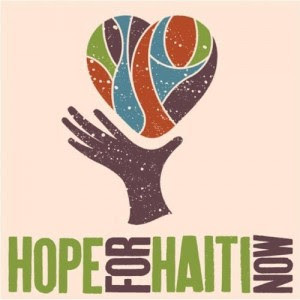 Hope For Haiti Now is available on iTunes and all the proceeds go to a whole slew of nonprofits, including the Red Cross. Seeing as you get 20 songs for $7.99, its a good deal even if the proceeds weren't for charity! I have to say you're so talented!!! Your page looks great here and I'm so proud of you :) Love you, crazy lady!